The Big Apple in Colborne, Ontario is Quite the Highway Stop! 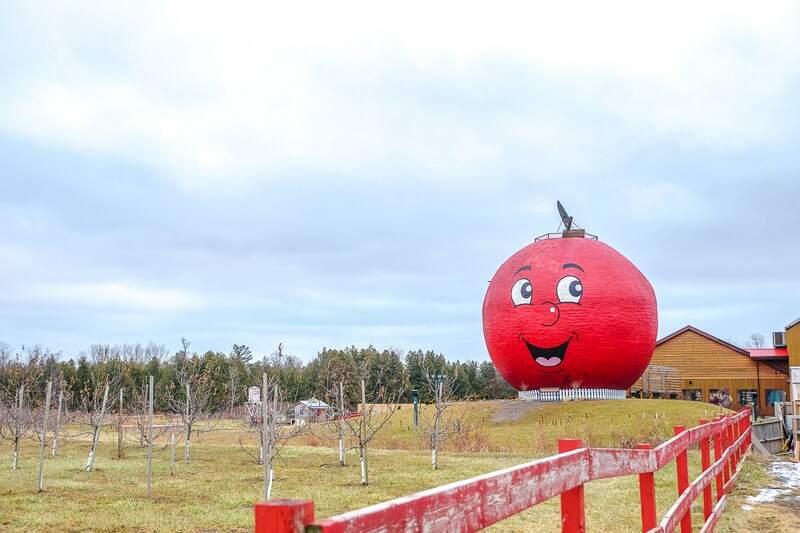 Driving between Kingston and Toronto and wondering what the giant red apple with a smile is all about? That’s The Big Apple in Colborne, Ontario, of course! Originally opened back in the 1960s, this roadside landmark farm has been growing and changing over the decades offering families food, a petting zoo, and loads of fun. We stopped in on the way home from Kingston and we are sure glad we did! If you need food, there’s lots on the menu in their restaurant – but you can also buy baked goods from the bakery to take with you! From The Big Apple location to activities you can do there, here’s what we know from our stop at The Big Apple in Colborne, Ontario! Where is The Big Apple? The Big Apple is located in Colborne in Northumberland County. This is basically half way between Toronto and Kingston. If you are driving on Highway 401, you are looking for exit #497. You will also see a GIANT red apple on the side of the highway. You cannot miss it! …and you’ll see a GIANT RED APPLE! Once you get off, head south towards Lake Ontario. Turn right at the first set of lights and then another right when you see the driveway for the Big Apple. The whole thing is very well marked so it’s hard to get lost. When you first drive in the driveway, you kind of get overwhelmed by all the different things going on. There are signs everywhere directing you to the parking lot and all the different things you can do there. Here’s a rundown of what’s happening at The Big Apple in Colborne! Pie Shop – above all else, The Big Apple is known for its apple pies and other baked apple goods. You can buy large and small pies (we bought a small one) as well as apple bread and other goods made with pecans, strawberry-rhubarb, etc. There is plenty of sweets to go around. If you are in the mood for a trinket or home item, they also have country knick-knacks and Canada souvenirs for sale. When you first walk inside – the bakery is ahead of you. Restaurant – Inside the pie store is also a restaurant called The Smokehouse. This is a full-service grill with fries, ribs, hamburgers, and loads of other grilled, fast food options. They also have “to-go” options. Once you pay, there is seating to enjoy your order inside or out in the large picnic area, weather depending. Brewery/Shop – You can stop in to The Big Apple to pick up a few cans of “401 Cider” which is made by 401 Brewery (at The Big Apple) as well as local craft beer done by Barley Days Brewery in nearby Picton. Eric has visited Barley Days and they do an amazing job with their beer! Chocolatier/Sweet Shop – Inside the main doors and to the left there is massive sweet shop and chocolate shop full of chocolate, candy, fudge, frozen yogurt, etc. Mr. Applehead – You can go inside the giant apple – named Mr. Applehead – which is said to be the largest apple structure in the world. You can take a photo with it, and climb to the top inside for views of the area. Mini Putt and Other Games – There is a seasonal mini putt course for kids. It’s free to play but we can imagine it being busy in the summer time! There is also places to play Bocce Ball, Shuffle Board, and more. Train Rides – This is also definitely for the kids. The mini train takes a trip through carved animals. It’s free – but runs at limited hours during the summer. Dog Run Park – If you are travelling with a dog along the 401, The Big Apple has a dog park. This can be great for letting it out for a bit of a run and a bathroom break since there aren’t many other options along the highway other than gas station-type rest stops. RV/Camper Parking – If you have a camper trailer or RV and need a place to stop for the evening, The Big Apple might be a good place for you. The location is close to the wine region in Prince Edward County so exploring that area is easy from Colborne. Food Truck/Picnic Area (Summer only) – They do serve food outside at a food truck by the parking lot, but this was closed off when we visited in the winter time. This is where the outdoor picnic area would come in handy – which you could very well eat at with your own food if you were just stopping for lunch. Besides the fact that they have a giant smiling red apple along the highway, The Big Apple is famous for the pies they make. If yiu are driving from Toronto to Kingston, the large sign facing the highway states almost 6 million pies sold (at the time of writing). Eric lived in Kingston for years and has been passing that sign for over a decade now. He can remember when it was under 3 million so that’s a lot of pies that they pump out each year! The famous “Big Apple” apple pie! You can eat your slice of pie onsite or you can take a boxed version home with you. We took ours home and cracked it open with the family. Honestly, it’s good – but definitely warm it up in the microwave or oven. They are pre-cooked – but it just tastes better warm (and maybe with a scoop of ice cream)! The Big Apple – you can go closer for a photo! Overall, we had a nice little visit to the Big Apple. It was the wintertime so it definitely wasn’t up to full capacity with all the attractions and whatnot. If you are in need of food, have a dog that needs to run, or have kids that need a fun break during your long drive, then The Big Apple is for you. It’s fun to check out to stretch your legs and since it’s so close to the highway it’s not a huge time commitment. That said, we’re glad we stopped. As we mentioned above, it’s something that Eric has driven by no less than 100 times over the years. Doing this blog has allowed us the mindset to get out and explore things in Ontario – things like the Big Apple! And there you have it – our experience stopping at The Big Apple. Would we stop again? Sure, if we have some time to kill and a bit of money to spend. It’s fun to check out, but we wouldn’t go out of our way just to go again. Have you been before? Do you always make a point of stopping? Get in touch and let us know!